I used to love chocolate rice cakes but its so disappointing that all the ones available ready made contain refined sugar! I have recently started making these at home and absolutely love them. I actually made a batch especially for my flight to India and they were such a great snack on the plane. They don’t take long to make and they are a great afternoon snack if you need something sweet to carry you through the afternoon. 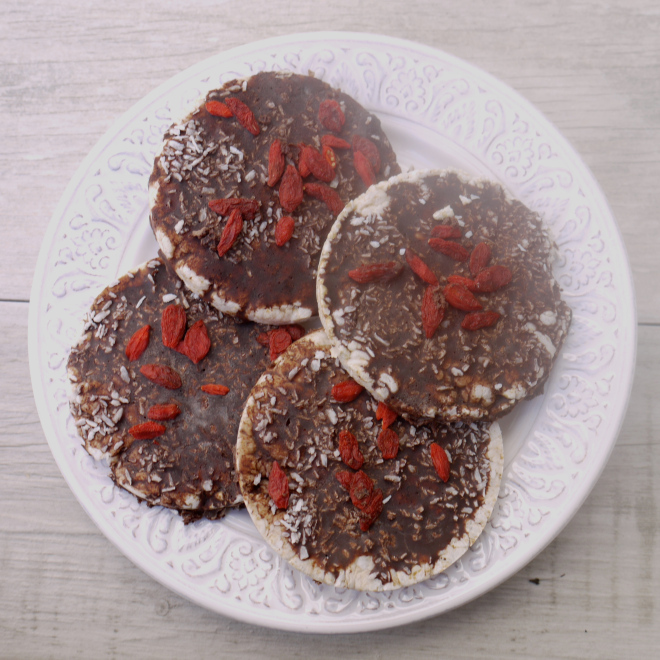 My favourite toppings are goji berries and desiccated coconut, but you can experiment with different things, or just keep them simple with plain chocolate. Half fill a small pan with boiling water. Balance a heat resistant bowl on top and melt the cacao butter slowly. Once it is melted remove from the heat. Stir in the maple syrup and raw cacao powder until it is evenly mixed in, then allow it to cool a little so that it thickens. Place your rice cakes on a tray lined with greaseproof paper. Pour over the chocolate so they are evenly coated. The thicker the chocolate, the less messy this bit is! Add any toppings, then place the rice cakes in the fridge to set. Once the chocolate has set, keep the rice cakes in an airtight container to store.